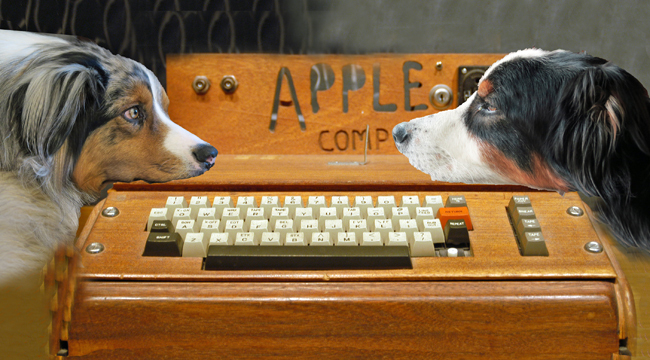 APPLE-ONE ON CROSSCURRENTS, 6/29 – Doggedly Yours… Howling, Humor, and History. APPLE ONE ON CROSSCURRENTS, 6/29: A computer created by Steve Wozniak out of an assortment of parts that he had soldered onto a motherboard, was booted up on this day in 1975 and shown to his good friend Steve Jobs. Gavin and Wyatt exam the Apple One prototype which pioneered today’s personal computer. You need not be a computer geek to join the Apple One celebration with John on Crosscurrents 6/29 at 8 a.m.
Don’t know if this is a reply so much as a comment, but I bought one of the first Macs sold in Alaska back in 1984, and I had to go to Soldotna to get it. It has remained my computer of choice ever since.